Donated items from the UCF Student Union's relief drive made their way to Florida's Panhandle earlier this week. Following Hurricane Michael’s devastation to the Florida Panhandle and southeastern United States, UCF has pitched in to statewide recovery efforts to support the affected communities and begin the rebuilding process. The UCF Student Union hosted a relief drive Oct. 12–15 and received an assortment of donated items, including nonperishable food, water and clothes from students and the community. The drive was part of a larger local effort organized by Gray/Robinson law firm, which partnered with Sorensen Moving and Storage for a delivery truck, Centerplate food and beverage corporation for pallets of water and food, and UCF. The firm posted regular updates to its Facebook page on its journey to hard-hit Port St. Joe, which is nearly 100 miles southwest of Tallahassee and just 12 miles from Mexico Beach, where the storm first made landfall. 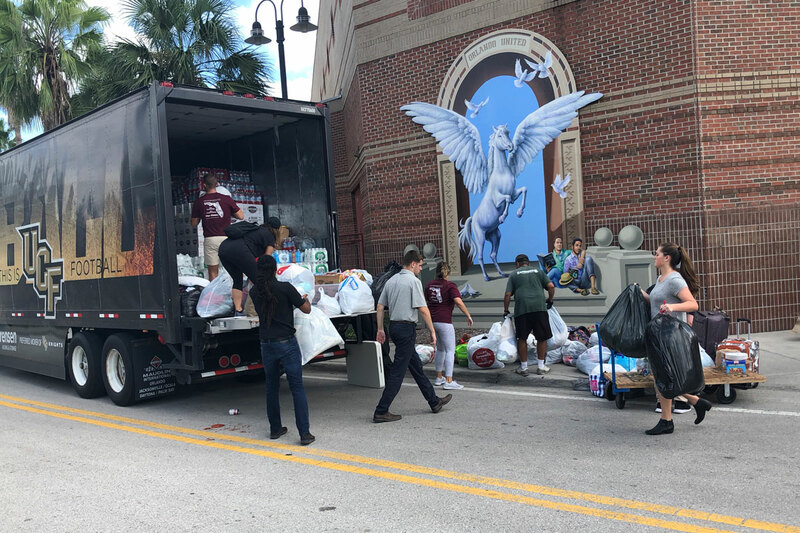 UCF President Dale Whittaker tweeted a message of gratitude for the generous support and quick turnaround to ensure the supplies could help those in need in a timely manner. 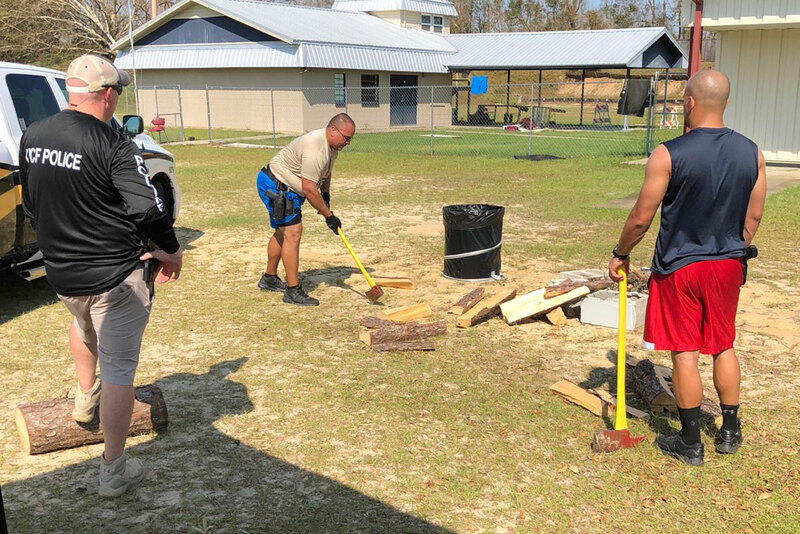 UCF Police Commander Scott Freeman ’11 is leading a group of three other officers who traveled to the Panhandle to volunteer in conjunction with the Florida Police Chiefs Association. Their current mission is to provide security at a law enforcement annex and maintain the safekeeping of the weapons and equipment that the facility stores. Another team of four UCFPD officers is expected to deploy Friday to relieve the current team. The law enforcement annex has no running water or electricity, so UCFPD officers get to work in building a fire. Any UCF students or staff from the impacted counties who have been affected by the storm are encouraged to reach out to support organizations on campus. Students can contact Counseling and Psychological Services’ 24/7 crisis line at 407-823-2811. Employees who have concerns or anxiety related to the weather or who are in emotional crisis can contact UCF’s employee-assistance program, HealthAdvocate, for assistance. Eligible employees and their dependents can receive free, confidential assistance by calling 877-240-6863. If you’d like to support recovery efforts, Volunteer Florida is the the state’s lead agency for volunteerism and service. There are also a number of charities you can contribute to that will help support relief efforts in the aftermath of the storm. It is important to verify an organization’s credibility before donating. Charity Navigator, an organization that evaluates charities, has a page that includes the names of reputable charities. “Relief for Hurricane Michael” is listed at the top of the web page’s Hot Topics tab.